It’s often said the best way to catch more fish is to understand them as much as possible. You need to know where they live, what they feed on and where and when they spawn. Then ask yourself the question, “Why?” The simple, or should we say complex answers will help you locate fish. Now, however, the questions is, “How do I catch them?” Rig It Right Essentials West Coast Sport Fish is aimed directly at short-cutting that learning curve and giving you the knowledge learned over many, many seasons, on where to target fish, what to use, and how to fish so you can tangle with lunkers. SKU: AF33003. Categories: Sports & Recreation, Fishing. Tags: fish, fishing, rigs, sport fishing, west coast. It’s often said the best way to catch more fish is to understand them as much as possible. You need to know where they live, what they feed on and where and when they spawn. Then ask yourself the question, “Why?” The simple, or should we say complex answers will help you locate fish. Now, however, the questions is, “How do I catch them?” Rig It Right Essentials West Coast Sport Fish is aimed directly at short-cutting that learning curve and giving you the knowledge learned over many, many seasons, on where to target fish, what to use, and how to fish so you can tangle with lunkers. 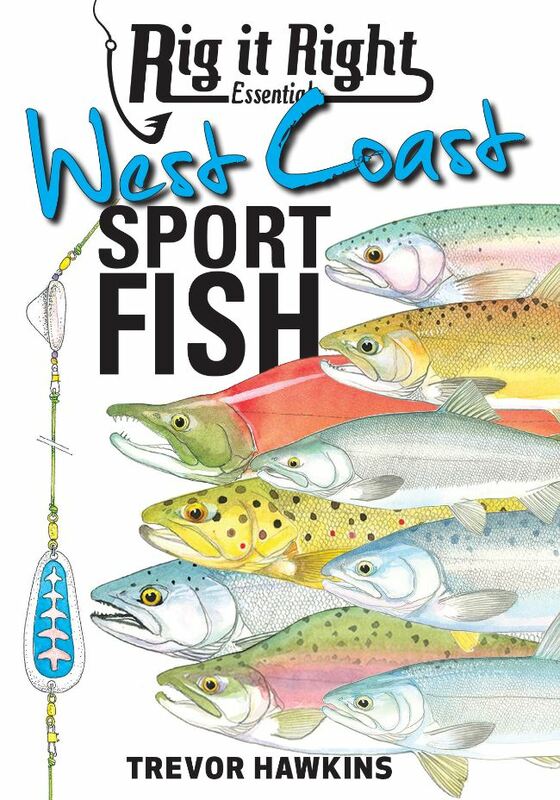 Rig it Right Essentials West Coast Sport Fish book is jam-packed with knowledge to help you rig up and catch more fish. Rigging up can be as basic as a single hook tied to the end of your line, or as fancy as a Side Planer Setup and anything in between. It all comes down to what species you’re fishing for and where. You will find a fantastic selection of basic proven rigs that can be used to catch some of the most popular West Coast species from bank or boat. Also included are important technical tips to get the most out of the rigs. It also describes each species mentioned in detail and supports those descriptions with realistic illustrations for ease of identification. A passionate angler, artist and illustrator for most of his life, Trevor Hawkins has been fishing both fresh and saltwater for over five decades. In his earlier years he started and managed his own printing business, which he was involved with for some twenty years. During that period he still fished every moment he got as well as continuing on with his art career also. In the late 1990’s he stepped away from the printing business completely to concentrate entirely on pursuing a full time career as an angling and outdoor author, angling illustrator in magazines and books, and also becoming an editor for a specialist freshwater fishing magazine. His main fishing passion is chasing wilderness river trout with light fly rods and small flies, but he is equally at home chasing lake trout and saltwater fish or casting lures for other fish species, particularly in remote locations out of a kayak. His other passion is heading into wilderness areas via hiking or 4-W-Driving and camping while photographing and sketching anything and everything that catches his eye. In Fly Fishing Knots, Rigs & Leaders, you will discover that fly fishing is one of the world’s most popular pastimes. Until now there has never been a book solely devoted to knots, rigs and leaders for fly fishing.